Hosting for 1 Web 1.0 website. All the text, graphics and images for your website have to physically sit somewhere so that internet browsers can populate and display your website. This is what hosting provides. Hosting for 1 website. All the text, graphics and images for your website have to physically sit somewhere so that internet browsers can populate and display your website. This is what hosting provides. Things change. Phone numbers, addresses, events, promotions. Your website needs to reflect these changes. 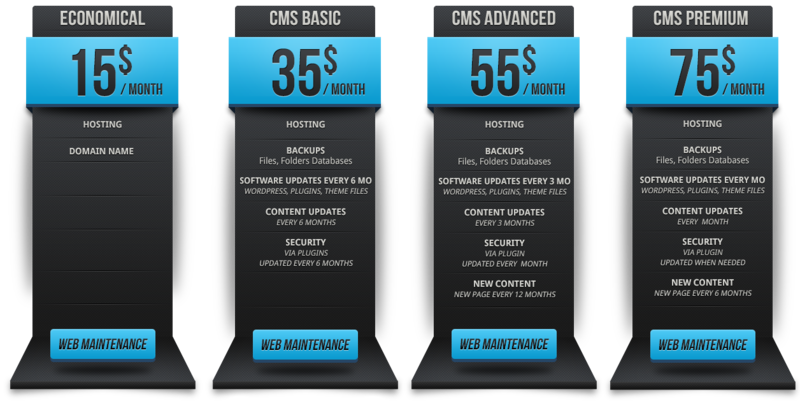 Just like your smartphone and its apps require updates, so does your Wordpress CMS website's Files, apps and plugins. Includes updates to Wordpress, Free Plugins & Theme Files. Premium Apps and Plugins not included. No one thinks their website will get hacked. However reality is hackers are trying to gain access to your website every minute of every day, 24 hours, 7 days a week... world wide. We have the logs with the hackers geographical location and IP address to prove it. When something catastrophic occurs, it's your backups that save the day. Just like your smartphone and its apps require updates, so does your Wordpress CMS website's Files, Premium Apps and Plugins. Includes updates to Wordpress, Free Plugins, Premium Apps, Premium Plugins & Theme Files. No one thinks their website will get hacked. However reality is hackers are trying to gain access to your website every minute of every day, 24 hours, 7 days a week... world wide. We have the logs with the hackers geographical location and IP address to prove it. Our security software prevents most attacks and your backups exist for the rest. Over time certain keywords will work better than others. Additionally, Google is constantly changing its search algorithm. As such, your website will need keyword SEO changes to keep ahead of the game. You will receive weekly reports showing how many visitors visited your website. What pages they visited. How long they visited each page and more. We are notified immediately if your website does down. by being notified, we can response as fast as possible. You will receive weekly reports showing what position your website ranks for each of your keywords. You will also get reports on your Google Page Rank, the number of backlinks to your website, local listing results and Google Mobile rank tracking. Finally we can even track You Tube videos and where they rank in search engines. You will receive weekly reports showing what position your website ranks for each of your keywords. You will also get reports for the number of back-links to your website, local listing results and more. Finally, we can even track You Tube videos and where they rank in search engines. CloudFlare protects your websites from online threats and DDoS attacks, while making them twice as fast around the world. CloudFlare runs a globally distributed network. CloudFlare stops malicious web traffic, fights DDoS attacks and automatically caches and delivers content for faster load times. Additional pages allow you to create landing-pages for additional keywords. Landing pages means the new web page is coded for your new keyword and a specific call to action. Soon to become a requirement, an SSL encrypts your website. Simply having an SSL fosters trust and can increase search engine ranking on Google and other search engines.